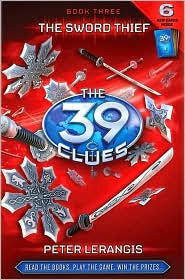 Unlike The 39 Clues Book Two: One False Note where the action is non-stop, in The 39 Clues Book Three: The Sword Thief things slow down, and we get to know the characters better, especially the rivals, as they pursue their quest for the 39 clues. I liked this change. It reminded me of The 39 Clues Book One: The Maze of Bones, where all the characters were introduced and we got a good picture of them. With this book the reader gets a chance to get his bearings and to recap all the events that now leads the brother-and-sister duo team of Amy and Dan Cahill to Japan and Korea. This time we learn about the historical person Toyotomi Hideyoshi who has hidden the third clue. As the hunt moves to the Orient, Amy and Dan have no choice but to enlist the help of their Uncle Alistair Oh. With the one rule of the race being TRUST NO ONE, Amy and Dan must exercise caution as to how much to divulge of their knowledge and exactly how far to trust two of their rival teams—Alistair Oh and the Kabra siblings—while dodging bullets and swords to escape the yakuza who guard what belonged to their ancestor. It’s a psychological game and we are left wondering what is going to happen by the end of the book. I truly felt author Peter Lerangis captured the original voices of Amy and Dan and their vulnerability as orphans who have lost much. For me, this was essential to keep the thread of the story solid. If it had continued with non-stop action as in Book Two, the impetus that keeps the reader emotionally involved would have been lost. By also engaging the emotions of the other rivals instead of just relating their killer actions, the stakes are elevated. And of course, the cliffhanger ending keeps us hungering for more. 5. Giveaway ends February 9, 2010. I was just looking at these books at Chapters a few days ago. My son would love them. I haven't heard of them yet. would love to be entered. I'm so jealous of this contest! I've been anxious to read this series and share it with my nephews ages 10 & 5. This is a great giveaway and I would be happy to add a link to it on my sidebar. Good luck to everyone! Thanks, Debbie! I appreciate you adding the link. My grandson would love these books. I've had them on my wish list for a while. I am a new follower. Please enter me in this contest, it's great. I heard they are awesome! My friend won't stop talking to me about how cool the series is. I am 10 years old and love to read! I would really enjoy reading these books! My comment doesn't count since I'm in the USA, but thanks for a good review! A Canada only contest, boy is that rare to see! I'm a new follower and would love to start reading this series. Thanks for the review! Sounds like a great storyline and I look forward to reading these and getting to know the characters.